The first performance of the evening was Andres Laza Moreno and Isabel Acuna, whose dancing is truly salon and very elegant and refined. Then Gabriel Misse and Natalia Hills came on - and you could see eyes open wide and mouths drop as this couple whirled and twisted down the floor in a performance that was definitely not salon, but breathtaking nonetheless. 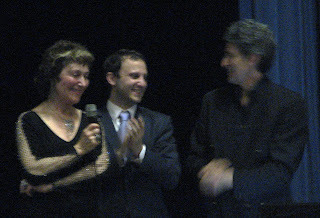 Finally the maestro Javier Rodriguez and his partner Andrea Misse danced in a combination of salon and performance, though I think the general feeling was that they were outshone by Gabriel and Natalia. My verdict on the rest of the night - it was a feat of great organisation and I take my hat/s off to the organisers Sima, Ralph, Pedro and Sophia for the work involved. White linen tablecloths, plenty of excellent food, a bar and a chair for everyone - even some for those who turned up at the door hoping to get a ticket were obliged. Were there any niggles? Yes I have a couple, but I will save them for the evaluation forms as I know just how difficult it is to organise an event - especially one of this magnitude. 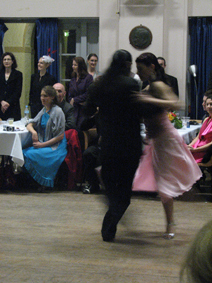 Sadly we missed the following night with the International Milonga at Marrickville (family has to take precedence at times), but word has it that it was a great night and the technical brilliance of the overseas teachers was much admired. Workshops were many and very well attended so I heard from the registration desk. I did manage to get to one of the workshops I had booked in for and was impressed with the professionalism and tight program, though a bit disappointed that they were so big (a factor that can't be avoided with teachers of this calibre). Sydneysiders did not attend the Festival in great numbers, perhaps because some would prefer to join a Festival away from their hometown, or felt that is was too expensive, or like so many people with a first event wanted to see how it went before they became involved! Probably no one reason. 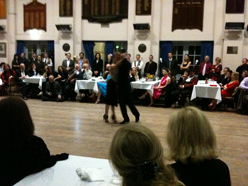 Nonetheless Sydney was very lucky to have a tango Festival of such calibre and this blogger will watch with interest to see what the organisers have planned for next year.